Feel free to discuss it and/or leave your suggestions for new record categories in this thread. I'll be gone all this week so I won't be able to work on it until I get back, but it will automatically parse and update the records as necessary each pickup. EDIT: Oh, and it's not really "all-time," it's since logs have been stored/parsed on ffpickup.com which started November, 2012. Last edited by squeek. ; 06-01-2013 at 08:33 PM. Categories for heals. Tossables and medkits. Maybe directs/indirects? Healing flag carrier? Not currently do-able. Can only use things that are logged. It's really only kills/deaths/buildables/flag stuff. I will do most/average kills while having the flag and most/average kills of the flag carrier, though. Last edited by squeek. ; 06-01-2013 at 08:30 PM. ROFL 18 railguns in one round! This is great squeek. You stole all my engi records. can you combine the STEAM IDs and give each player a custom name? like "im like a 9 and ur like a 5" should be CrunK and "Megatron" should be biohaZ. etc. Steam IDs are what's used to differentiate between players, and I can indeed put custom names per Steam ID if necessary. Right now most of the names are calculated based on the most used name found for that Steam ID in the logs. I'll fix the ones that have a different name than what they are known by eventually. The system is way more dynamic than what that simple page lets on, and I'll be able to do a lot more with it in the future (each Steam ID can have a page showing their specific records, a new log viewer for each log using this new data, etc). All the data is stored in a database so I can do a bunch of cool stuff with it in the future. Last edited by squeek. ; 06-02-2013 at 12:03 AM. should all not exist, as they involve breaking the pickup rules. I assume the averages to do with the flag are only from when the player is on Offence. And how exactly do you kill someone who isn't yourself with the world? Use sv_cheats 1 and get yourself the Gravity Gun and throw a prop at their face? If it isn't players only, add ones for the most played map, most nominated map, etc. I mean, everyone knows destroy and that will be there, but y'know. squeek wins at average railgun kills! Surely I can create a server, murder a friend, and upload the log to the log parser, and it'll show me on there. Please make it so that somehow, it only uses ff.pickup logs? Oh, and the search functions on the log parser don't really work. None of them do anything, (they try to, but it just refreshes the page) and you can't change pages. And it'd be great if someone can make it so ffpickup.com has a link to the parsed log in the pickup details. True; they are meaningless records although the O HW record is a bit funny. I'll filter them out eventually. I'm not totally sure, actually. That info can be found on the FF.Pickup website, although nominated maps are not recorded. Surely I can create a server, murder a friend, and upload the log to the log parser, and it'll show me on there. No, this only uses logs that get parsed by the bot in IRC. Been something I've wanted to do for a while. I'll see if I can figure out how to do it reliably. A player killing another with World has only happened 3 times total and it's been the same each time: a medic killing a HW with World right after the HW kills the medic. L 04/22/2013 - 23:46:25: "scrumptious. homie'<73><STEAM_0:1:3700597><#FF_TEAM_RED>" killed "zexel?<71><STEAM_0:0:15890560><#FF_TEAM_BLUE>" with "weapon_assaultcannon"
L 04/22/2013 - 23:46:27: "zexel?<71><STEAM_0:0:15890560><#FF_TEAM_BLUE>" killed "scrumptious. homie'<73><STEAM_0:1:3700597><#FF_TEAM_RED>" with "world"
L 04/22/2013 - 23:50:01: "scrumptious. homie'<73><STEAM_0:1:3700597><#FF_TEAM_RED>" killed "zexel?<71><STEAM_0:0:15890560><#FF_TEAM_BLUE>" with "weapon_assaultcannon"
L 04/22/2013 - 23:50:02: "zexel?<71><STEAM_0:0:15890560><#FF_TEAM_BLUE>" killed "scrumptious. homie'<73><STEAM_0:1:3700597><#FF_TEAM_RED>" with "world"
L 02/05/2013 - 21:08:15: "teamcake. NeoNLight*pS+M|M+<61><STEAM_0:0:3610613><#FF_TEAM_RED>" killed "BOSS | MafiaMan^HeLL<65><STEAM_0:0:138099><#FF_TEAM_BLUE>" with "weapon_assaultcannon"
L 02/05/2013 - 21:08:15: "BOSS | MafiaMan^HeLL<65><STEAM_0:0:138099><#FF_TEAM_BLUE>" killed "teamcake. NeoNLight*pS+M|M+<61><STEAM_0:0:3610613><#FF_TEAM_RED>" with "world"
I think what's happening is that the medic is infecting the HW, then the HW kills the medic. The HW then types kill in console (or changes team; anything that kills the HW). When you suicide while infected, the infected player gets the kill. But, the key is that the medic is dead; it tries to use the medic's active weapon as the killing weapon, but none exists, so it defaults to World. Last edited by squeek. ; 06-02-2013 at 04:40 PM. I used some of my special jew sauce to stick this thread to the top. Only 4v4s are included. Map variation is unavoidable and I don't really think having different records for every map is worth it. Selectively excluding certain maps from counting towards records also seems like a bad solution. There are only a few records that might only be possible to beat on a certain map, but I really think it's not that many. Most engi kills in a round is not even currently on changeofpace, for example. 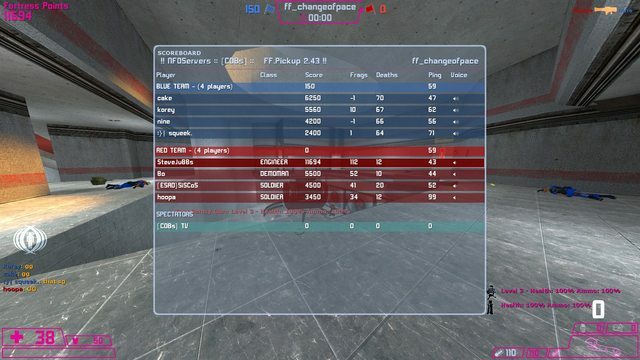 I know NeoNL got ~100 kills on changeofpace as engi one time long ago. Last edited by squeek. ; 06-26-2013 at 04:13 AM. Last edited by NeonLight; 06-26-2013 at 04:33 AM. Added a page for each player that lists all their personal bests. Sorry if it's slow, I still need to figure some stuff out I think. Will hopefully add some more record categories soon, maybe have a leaderboard type thing for each record, and other such goodness. Last edited by squeek. ; 06-26-2013 at 11:22 AM. What are the requirements for Average Class Choice Frequency's? I'm also tied with Juice for average kills as Scout, so I'd assume that has a requirement too. Last edited by ddm999; 06-26-2013 at 02:50 PM.